So We thought Halloween costumes were bad in our decade? Love the themes she chooses. Some of you may have seen how my last post turned out. For some reason my image was added to the right column and not inside my post perimeters as shown when I created it. I tried maneuvering it in several ways and nothing worked. I asked for help now 2 times on support. Any ideas. I am not posting until it is fixed. Maybe I should delete and redo, but it is too late for that challenge and am disgusted. I do not know about anyone else, but I seem to have trouble of some kind when posting quite often and I have a bout had it. Any ideas, before I am totally done. Thank you. I can sympathize with you. I’m not the best at technical stuff and I had to try two or three WordPress themes before I found one that I could use without too much hassle. But I got there in the end with the Twenty Ten Theme. I know it. I switched back to the theme that worked for me before and finally got help to get it formatted today. I know there may have been a way to fix it on the other theme, but tried and wasted hours. This theme is less hassle I found out. I never knew some were much harder than others. Thanks for commenting. Thank you. I will check it out. It happened again to me and I get no help on the forums. Livonne, Finally got help. Thank you. I wish they would keep things that work. I should have never tried a new theme I think also. If any one else is seeing this incorrectly. I apologize; I have asked for help because it was fine on the draft. Once I published this is how it came out. The daily post prompt today is so apt to my feeling…….Daily WP Prompt. Sometimes it seems as it is all that keeps me standing. May the music never die. Thanks so much for playing this week. You are welcome and thanks for the opportunity. Along my wanderings on Word Press this week, I fell in love with this photo. Thought my readers, might get the same peaceful feeling of seeing it that I do. Thanks to 365 dni w obiektywie LG for allowing me to share it with you all. Niezwykłe ujęcie odbijającego się zachodu słońca o kostkę uliczną w mroźny dzień. Foto z LG G4. 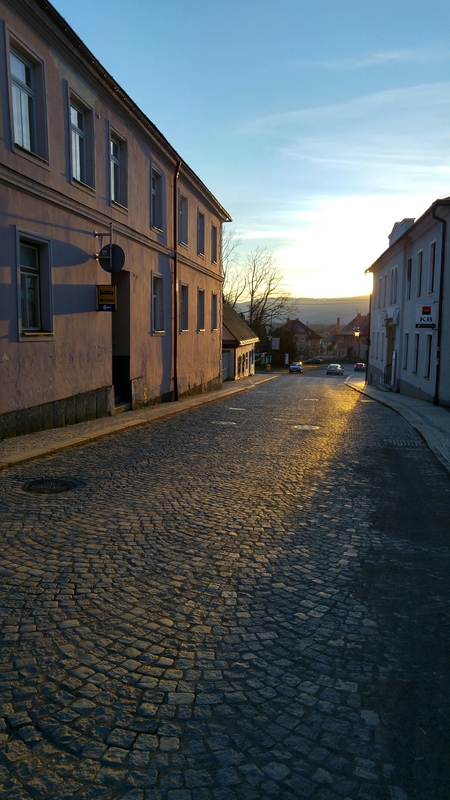 Unusual shot of the sunset reflecting on the ankle street on a cold day. Pictures of LG G4. Beautiful picture — it looks like you didn’t include categories or tags. You should so more people can enjoy it! Thank you for your kind comment. I also appreciate the reminder for tags: I do not reblog often, but when I do I forget that aspect. No big deal about your comment. I need reminders and am happy you did that here. The lighting is AMAZING in this photo! Thank you lisadorenfest. It really is wonderful. Thank you. All the best to you. I find this a beautiful and interesting post based on childhood memories. Wanted to share it. Some of them are much like my childhood also. You may also recall similarities? oh wait, I saw your other posts and saw that you do a lot of that, forgive me for not checking first — you can delete my comment if you want ! Magnolia just waiting to blossom. Beautiful. Beautiful magnolia. Love the cream shades in the petals. I disliked when I was out west where I saw none of these, even though there are things on the coast that are not in the south. Thanks for commenting litadoolan. Thank you. sorry I am slow getting back to you. Recycle those land fillers. I wanted to put the video which is at the end of the link-“hopefully.”- on here, but could not figure how to do it. The video in quick time shows a lot of simple ways to upcycle bottles like those below. Really simple stuff, you might want to try like I do. I Especially like the little plant one; Pretty cool. Have fun and let me know if you do anything with this. Also the video is in what I think is Japanese. It is easy to follow by mere watching of it though. Many people love Pinterest. In fact it is my favorite site except for Youtube. Have Pinterest, Add me here: Follow Luvapin and I will follow back.